This paella was over the top, almost literally! It was so loaded with goodness that it almost escaped the pan. Luckily we were able to keep it in check and scarf it down. If you are in the mood for seafood and full flavor, this is the dish for you! I have been wanting to make paella for quite some time now, but getting the saffron has stopped me from following through. Then I found saffron oil at my favorite local cooking shop, the Quincy Steamboat Company. I couldn't help but buy and bottle. I scheduled this week's family dinner to be at our house and got ready to finally pull it all together. A stop at the seafood counter to pick up some shrimp and clams (and some oysters that turned into a story of their own) and a little chorizo and we were in business. It turned into quite the day. The Steamboat shop that I mentioned earlier hosted a couple of chocolate cooking classes that day. I attended the earlier one, Chocolate 101 and enjoyed myself immensely! I know, that comes a shock to all of you that something involving chocolate would make me smile. Anyway, if you are curious about how that went there are pictures on my instagram or there is a short slideshow video here. It was so interesting to learn about the origins of one of my favorite foods, the process it goes through to become what we know as chocolate and how to work with it better. Man oh man does proper tempering make a difference. He was really able to dip things and get that sheen and snap. I can't wait to play more at home. Anyway, I rushed home from that to get ready for our grand paella party. I got things prepped and measured so cooking would be easy. I knew I would be working on everything once my family was already here and there would be a lot of cooks in the kitchen, so the more I had ready the better. After the onions were chopped and things were measured I turned my attention to the seafood. I got my bowl of ice ready for the oysters and was ready to get them set up. The guy at the seafood counter said they were pre-shucked and ready to go, that is why there was a band around it. So, I ran them under water and cut off the first band expecting the flat shell to come right off. NOPE! It wasn't budging. Crap! I had it all timed out and this was not part of the plan. So, I went to the next oyster hoping it was a fluke. No such luck. So, I did what anyone in this situation would do... pulled up some oyster shucking videos on YouTube. Of course they made it look easy. I struggled a bit, but finally got all of my oysters shucked. There was a lot of teeth gritting and consternation, but I have to say I ended up with some pretty decent looking oysters none the less. Of course all of this video watching and silent cussing to myself and the oysters put me behind on cleaning clams and taking the shells of my shrimp. Luckily MiMi was happy to step in to finish the shrimp so I could get cooking. The paella actually came together pretty easily. It was gobbled up and enjoyed by everyone. There are a few changes I would make for the next one. First, I would only use 3 1/2 cups of rice. We had more than enough rice and I think this would help us keep everything in the pan with less worry. Also, we tend to prefer mussels over clams, so I would make that swap next time as well. I think the smaller size of the mussels would also help in our volume problem. I would encourage you to consider these changes as well, but you will certainly be happy with it if you make it just the way we did this time. For dessert we had a smorgasbord of options. I had a white chocolate fondue with a variety of dippers. MiMi made pink velvet ice cream with a cream cheese icing swirl. 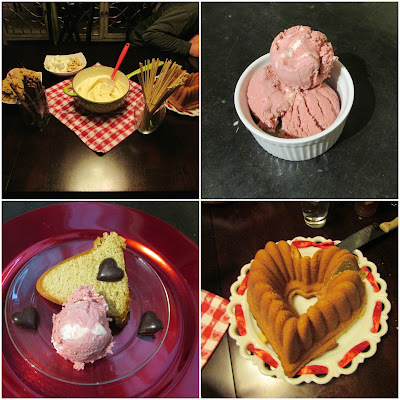 She also made a pound cake in the shape of a heart, knowing that would be perfect for cake and ice cream or as a dipper in the fondue. Nobody went home hungry, that is for sure! In 15 inch paella pan over medium heat, brown chorizo. Add oil, onion, garlic, and parsley. Cook 2-3 minutes, stirring frequently. Add tomatoes and continue to cook until reduced and fragrant. Add rice, keep stirring until toasted slightly. Spread rice evenly over the bottom of the pan and add chicken stock. Simmer for about 15 minutes, moving the pan every so often to distribute the liquid. From this point on, you don't want to stir the rice. Nestle clams down into the rice and allow to cook for 5-7 minutes. Distribute shrimp over rice and allow to cook until pink, about 8 minutes. While the seafood is cooking, add a little water if needed to make sure the rice is cooking and the seafood is steaming. You don't want soupy rice, but you also don't want it to be too crunchy. Once the rice is al dente and the shrimp is cooked, turn up the heat for about 30 seconds or until you just start to smell the rice on the bottom of the pan toasting. The toasted rice on the bottom of the pan is the socarrat and is a prized part of the dish! Finish with a quick drizzle of saffron oil and the reserved parsley. Serve with wedges of lemon and crusty bread. Thank you! We had so much fun, oyster shucking and all! And the paella was delicious, even if a little hand stole most of my shrimp right off my plate because "shrimp is good for me." Stinker! Effort looks like it was worth it! What a beautiful dish that looks delicious!! And hello yummy desserts, wow, jackpot of love desserts for sure!! It was definitely worth it! I can't wait to make another one, hopefully over a wood fire when it is nice out. We certainly had our fill of desserts! Luckily some cousins and an aunt and uncle showed up to help on those a little while we played some games. You are really spoiling us these days. We've had so much fun trying these new things. We have been eating pretty well lately! Mmm! I have yet to make paella, but it is on my TO MAKE list for sure! You definitely should do it! oh my - this is what I think I want my husband to cook me for my birthday!! Thanks for sharing on the "What's for Dinner" linky party! Mmm! I can come join you if you'd like a guest ;-) Thanks! I'll definitely have to bring it by, thanks Carole! This looks delicious! 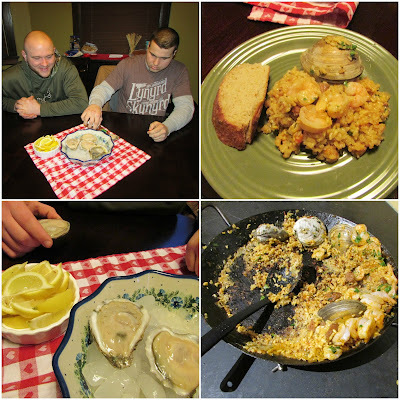 We had seafood too for our Valentine's Day Dinner. It's a great way to go. A steak sounded good, but we'll wait until we have better grilling weather! Greetings from the Bloggers Pit Stop! I think it is a new family favorite of ours as well. We all loved it and it really wasn't all that complicated to make. We can't wait to try more varieties! 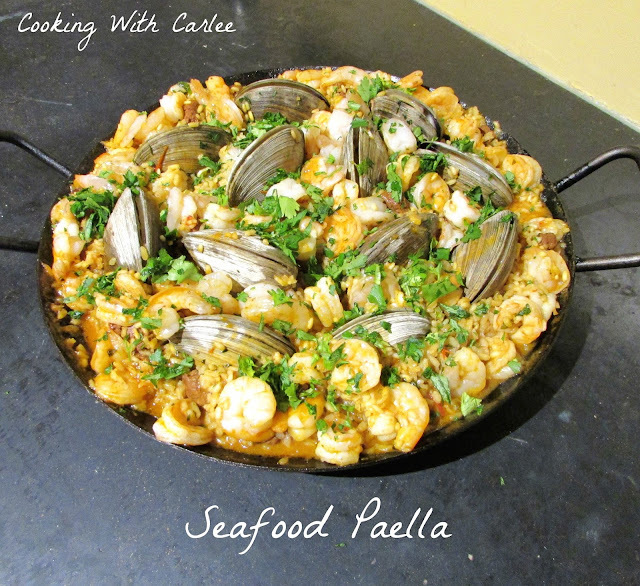 This paella looks hearty & delicious. I like the combination of spices as well. Have a fabulous week, Carlee. Thank you, we all really enjoyed it! I hope you have a great week as well! I have never made paella with seafood. This sounds awesome. Thank you for sharing at #overthemoon. Pinned and tweeted. What a great Paella! Thanks so much for sharing with Full Plate Thursday and have a fantastic day! Thank you! We all enjoyed it, that is for sure! Oh my gosh, this looks and sounds delicious! I feel as though I can smell it cooking right now! I have to try this. Thank you so much! It smelled so good and I loved how all of the flavors came together. I hope you love it! Wow, Wow, Wow! This looks amazing! It is so pretty and I'm sure it tastes great! Saving this one for a fancy stay-at-home date night. Thanks so much for sharing at Inspiration Thursday. It was so good and perfect for a Valentine's feast! Thanks for hosting! Wow Carlee, this look so good! Yummed and pinned too. My kind of food! Looks delicious, too.